Develop your science and your army, construct prestigious buildings and lead your civilization to victory. 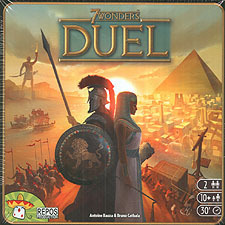 7 Wonders Duel is a stand-alone game in the world of 7 Wonders, made especially for 2 players. 7 Wonders Duel offers a whole new system of card drafting, 3 victory conditions, scientific progress, an original military system, and 12 Wonders to combine for addictive and continually new games. 7 Wonders: Duel is a standalone game for 2-players (Please note this is not an expansion to the main 7 wonders game). The game does build on the theme and some of the mechanics from 7 Wonders. It is excellent fun to play and in my opinion, I find this better than the 2-player variant in the original 7 Wonders. There is a real sense of suspense as each opponent watches the other's military endeavours and scientific progress. It's made much more dynamic, now that there are three game end conditions: (i) a race on military supremacy; (ii) a race on scientific supremacy and (iii) a civilian victory. The first two are instant wins the third condition occurs when all cards have been played and then it's time to add up the points to determine a winner (just like the original 7 Wonders). There is plenty of replayability. Each game is played with 8 wonder cards (from 12), 20 Age I cards (from 23), 20 Age II cards (from 23), and a combination of 20 cards for Age III (17 from 20 Age III cards and 3 from 7 Age III Guild cards). The game also introduces progress tokens of which 5 (from 10) are available in each game. This means that there is not too much randomness, but I believe that there is sufficient to allow the game to be fresh so it will be rare when 2 games are the same. Game time is 20 - 30 minutes, its fast to set up and quick to learn the rules (years to master)!! Good portability as well. Probably the best 2 player game I have in my collection, and I have a lot! This 2 player card drafting, mini civ building game is tight, vicious and gives an excellent amount of strategy and turn angst in a short play time, which makes it very satisfying. Players take turn to either take a card from the display, burn a card for money or use the card to build one of their wonders. Players have multiple paths to victory - they could pursue knowledge and progress, and if they successfully take 6 unique progress symbols they win immediately. The same happens if they build enough military dominance to push the military token all the way along the track to conquer their opponent. If neither of those conditions occur then it will go down to a points battle, in the usual 7 Wonders fashion. I find this to be a fascinating balancing act and players will need to keep a close eye on their opponent to ensure victory! So far most of my games have gone to points, but I've won with progress and lost through military as well. The game can be quite mean, as players will have to do some 'hate-drafting' in order to stop their opponent, and some of the Wonders special abilities are quite vicious as well, but it all adds some spice to the game! The production values and art is excellent, I'm not a big fan of these small cards, but I can understand why they needed to be smaller to make the playing area more compact. The game is excellent value at £19 and should give plenty of replays as well.